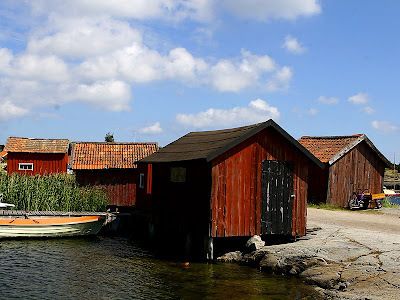 This picture of old boathouses is taken in Löka guest harbour at Möja in the archipelago of Stockholm. Möja is one of the most popular islands for travellers and boaters, and is also significant in size. A lot of old houses and buildings are well preserved at Möja, if you visit the island you will get a feeling of how people used to live here many years ago. For an example these boat houses were used by sailors or fishermen to keep there boats and fishing tools in.